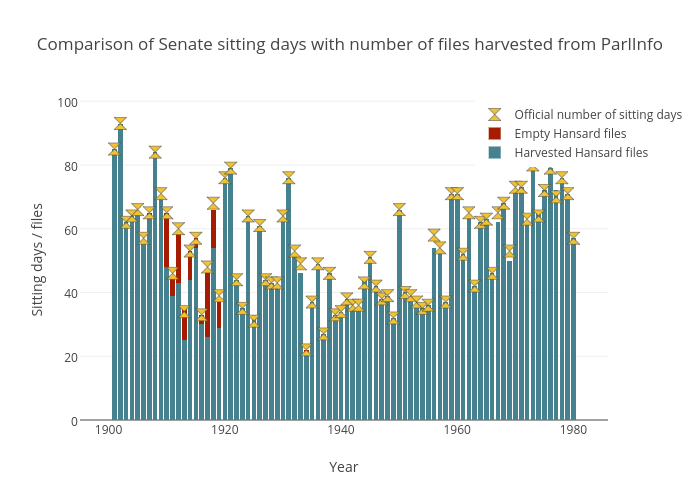 Wragge's interactive graph and data of "Comparison of Senate sitting days with number of files harvested from ParlInfo" is a stacked bar chart, showing Harvested Hansard files, Empty Hansard files, Official number of sitting days; with Year in the x-axis and Sitting days / files in the y-axis.. The x-axis shows values from 1896.1868999291191 to 1984.8131000708809. The y-axis shows values from 0 to 98.77287405812702.